Pocket watch meters were a common piece of test equipment in the 1920s; at a time when batteries and electrical devices were just beginning to come into the hands of the average person, there was a need for means to test and repair all of these new devices. 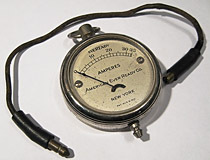 A pocket watch meter was called such because it shared the size and shape of a common pocketwatch, many such meters used surplus watch cases as the basis for their construction. This Eveready pocket watch meter is fairly representative of how such meters were constructed. A hole and stud at the base of the meter act as one terminal, with the other terminal being attached where the winding stem would be located on a pocket watch. Measurements would be taken by touching the stud on the base of the meter against one of the terminals being tested while touching a loop of wire to the other terminal and the socket at the winding stem. The example shown here still includes it's original testing lead, which plugs into the hole at the top of the meter where the winding stem socket is located. Though the manufacturer is unknown, this rather attractive looking pocketwatch meter makes use of a barely modified size 18 nickeloid watch case for its enclosure. 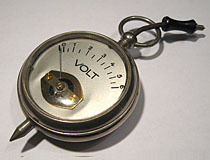 The 6 volt dial has an exposed brass coil armature and the case has the standard top lead common to pocketwatch meters. Unlike many meters of this type which have removable leads, the top lead for this device is permanently attached. The cloth covered lead retracts into the case when not in use. The Fluke 887AB AC/DC differential voltmeter functions like a comparator. Instead of displaying the voltage of the object being tested, the user selects a voltage on the large numeric readout and the meter tells the user how close it is to the actual voltage of the tested device. Though unwieldy, the 887AB can measure voltage increments as small as 0.01mV. This is far more precise than most of its contemporaries, perhaps making it worth dealing with the comparator-style operation. 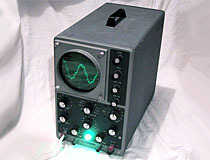 The Heathkit IO-12 is a single-trace vacuum tube oscilloscope. The IO-12 has horizontal and vertical inputs on the front panel, as well as a place to connect an external trigger. The IO-12 also has a z-axis input, though it is well-concealed. The user must unscrew a small metal hatch from the back of the unit to gain access to the z-axis connector. All connectors are the banana plug style common on older scopes, instead of more modern BNC connectors. 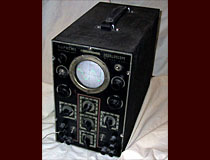 The screen diameter is an ample five inches, and rotary knobs are used for all front panel operations. 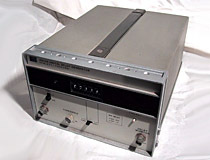 The horizontal frequency scale has two user presets, which can be set by inserting a screwdriver into a pair of holes on the right of the timebase control. 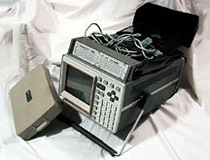 The 1640A Serial Data Analyzer is designed to be inserted inline between two serial devices, where it can be used to display and monitor the data being transmitted across the serial line. The unit can also transmit serial data, and has limited simulation functions that allow it to send and record data in response to strings of characters sent down the serial line by other devices. According to the available documentation, the Hewlett-Packard 43114A digital delay generator does not exist. Like most HP equipment, the unit is built to survive a land war in Asia. A machined aluminum frame and a complex tongue-and-groove enclosure protect the internals. The primary point of interface is a five-digit BCD encoder, which is used to set the amount of delay applied to the source signal in units of microseconds. At its maximum setting, the unit can delay a signal by 99,999 microseconds. The unit also has a knob to set the threshold for triggering; a value between zero and 90 volts can be selected. 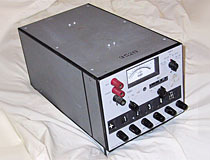 There are two outputs: a TTL output located on the front panel, and a +90V output on the rear of the unit. An interior inspection reveals that most of the internals of the device are powered by generic TTL chips. Unfortunately, the output of the 43114A is highly specialized. The unit does offset the input by the amount of delay selected on the BCD switch, but it does not preserve the data of the input. All of the output pulses are of the same length, regardless of the input signal, which makes it near useless for offsetting most serial signals. RZ (return to zero) signals could probably still be offset, though it would depend heavily on the width of the RZ pulses required by the destination device. This particular 43114A also has a serious operational failure: with a +5V logic signal as the input, the maximum speed the device can handle before it no longer triggers accurately is 20Hz. The Serfass RCM 15B1 conductivity bridge functions as a comparator. The component to be tested is attached to the device, and the user manipulates the controls to match the internal configuration of the device to that of the tested component. The eye tube provides visual feedback to this process: as the device is brought closer to matching the value of the tested component, the illuminated wedge on the tube becomes narrower. When the wedge of light in the eye tube is at its minimum width, the comparator has been successfully tuned to the component and the component's value can be read from the state of the controls. Comparators of are little use to the modern electronics engineer, as modern equipment can provide much faster and more accurate measurements. 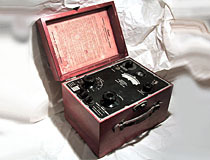 The Supreme 546 is a military-issue vacuum tube oscilloscope built in the 1930s and 1940s. The 546 is notable for its relatively massive 3" display, three times the diameter of many scopes from the same era. Internally, the 546 is exactly what one would expect from a piece of equipment of this age. The underside is a mass of tar and wax paper capacitors; topside there is nothing but tubes.